Wayne Gretzky’s NHL playing career spanned 20 seasons, but his greatest seasons came as a member of the Edmonton Oilers. As an Oiler, he was named the NHL’s Hart Memorial Trophy winner as the league MVP 8 seasons in a row and the Art Ross Trophy which is awarded to the league’s top scorer 7 seasons in a row. During a six year span, the franchise won 4 Stanley Cup Championships under the exquisite performance of the ‘Great One’ team captain Wayne Gretzky. In conjunction with Upper Deck Authenticated, Gretzky is now just the fifth athlete ever to be honoured with a unique 'Tegata' memorabilia piece. Utilizing handmade Japanese Hamada paper, Gretzky has inked his right hand in black and included an authentic Inkan stamp which aligns with the traditional craft. 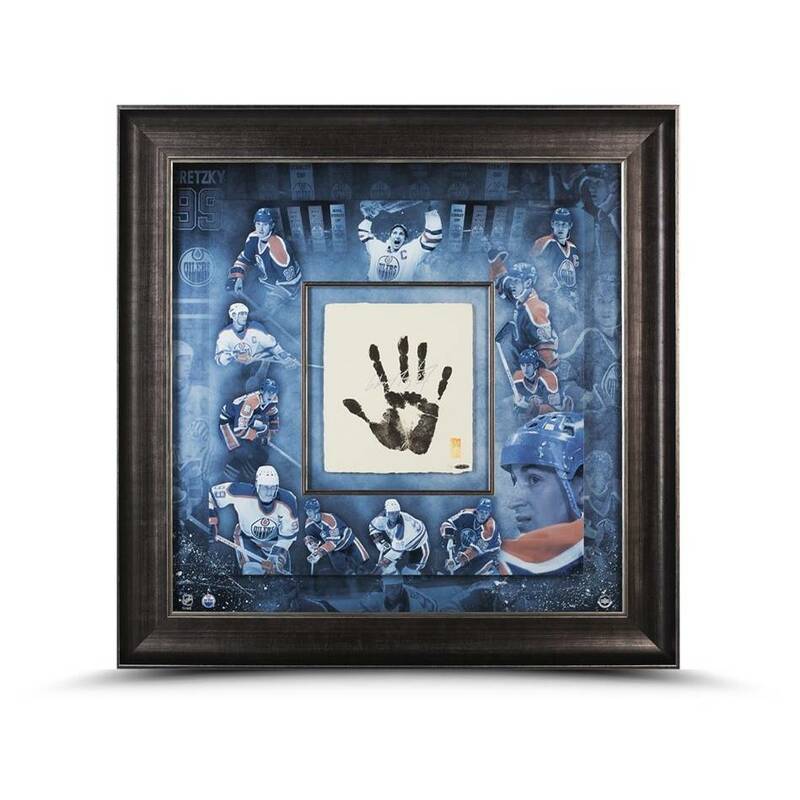 The overall keepsake, which measure 36" wide by 36" high, includes a 9.5" by 10.5" inset center upon which Gretzky’ hand has been inked and is surrounded by a double-matted collage style background of Edmonton Oiler images. Gretzky performed the ‘Tegata’ process under supervision of UDA officials and helped in the hand-crafting of 99 uniquely authentic stamps for the debut release. The limited-edition item is guaranteed authentic by virtue of UDA’s Five-Step Authentication Process.